This year, unlike last year and definitely different from the year before that.. I will host all the chaos and mayhem that we so happily call Christmas at my house. Should I be a little happier about this…? I have my menu’s all planned out (yes as in more than one, because around here they expect you to cook breakfast too) and we decided on which cookies to make for Santa.. This was after I had to warn my daughter that if she crushed the hopes and dreams of the smaller kids by telling them there was no Santa, there would be nothing.. Absolutely nothing under that tree from the Apple Store.. I know that is going to come back to bite me in my petunia somewhere down the road but we’ll worry about that later. Anyway, along with my holiday planning I always try to have something my guest can snack on.. Basically, this keeps them out of my way (and my kitchen) and also allows me to work quicker without the hassle of turning around every 30 minutes to answer the question.. 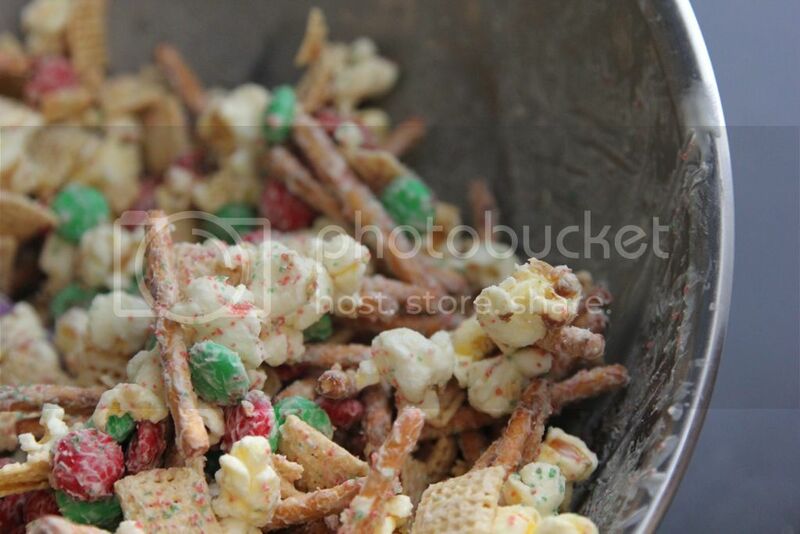 This year I am making this Holiday Party Mix, which my daughter and I have made 3 times (to test..yea to test) and are currently addicted too. 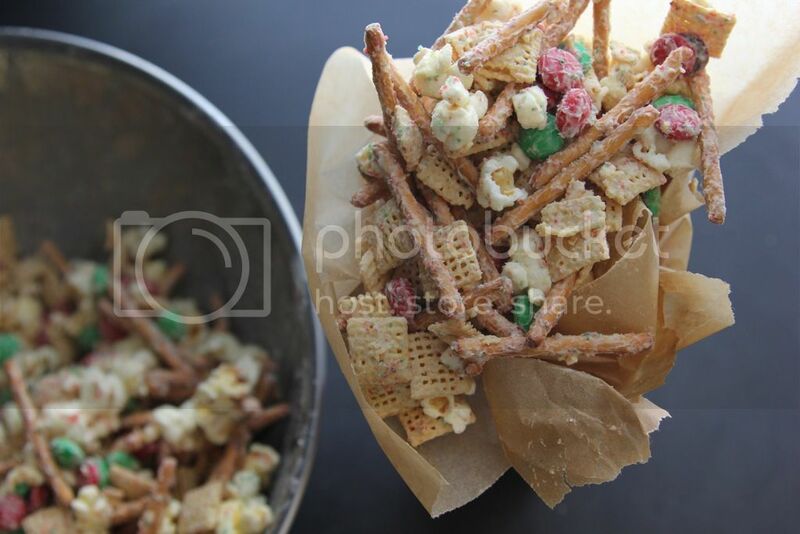 This Holiday Mix is a perfect combination of salty sweet that will have you crunching and munching so much so that before you know it you’ve eaten whole bowl before your guest even arrive..
Not that I know or anything..I’m just saying, it’s possible.. 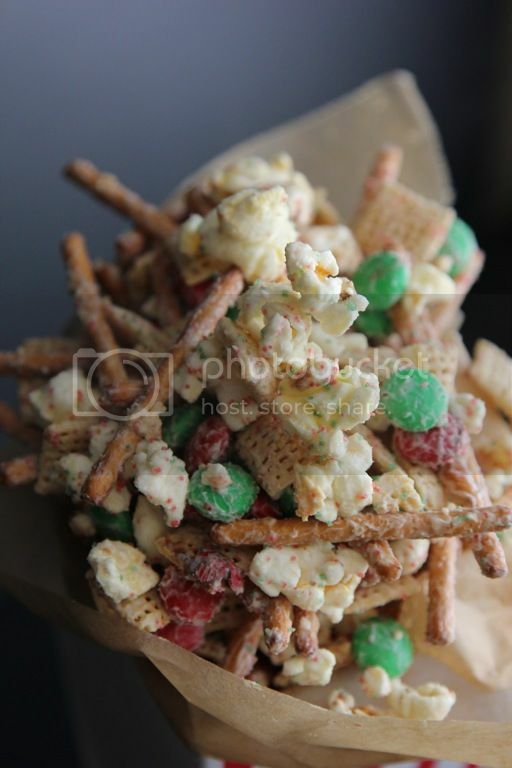 In a large bowl, mix popcorn, chex, pretzels and m&m’s, set aside. 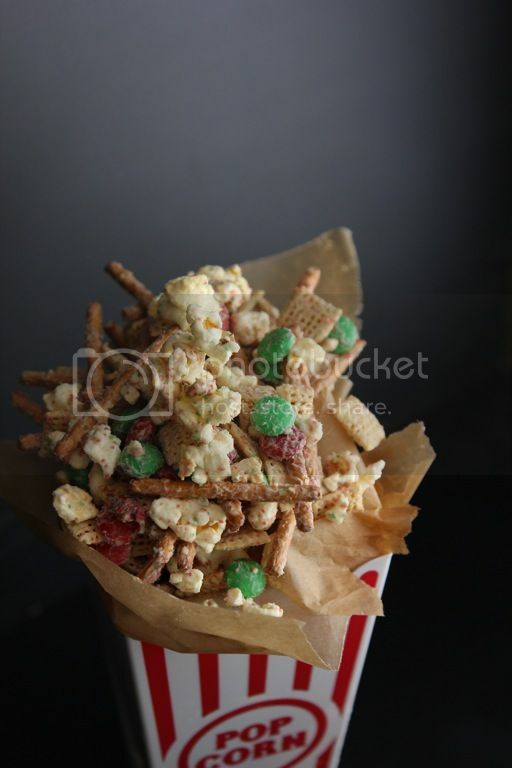 In the bowl of a microwave safe dish, place chocolate and shortening and microwave for 2 mins, stopping every 30 seconds to stir until smooth..
Pour chocolate mixture over popcorn mixture, toss to coat... Then Sprinkle the mixture with red and green sugar sprinkles… Spread onto waxed paper. Cool until setand Enjoy!! The 1st time I made this I didn’t let it sit ( I have a hard time following direction) and ate it immediately.. It’s fine just make sure you have lots of napkins to un-stick your hands..